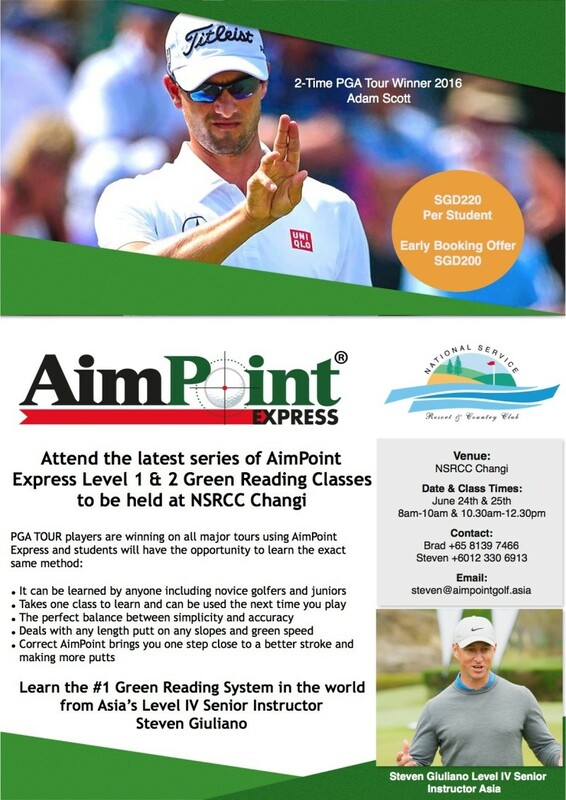 NSRCC Changi is excited to be hosting the latest series of AimPoint Express Green Reading Classes in Singapore on June 24th-25th. As one of only four Level IV AimPoint Instructors in the world I will be visiting the region where a series of the world renowned AimPoint Express Level 1 & 2 Classes will be delivered. I will also be running the NEW AimPoint Advanced Level 3 Green Reading Class which is designed for the serious AimPoint student, key techniques will be taught which have only previously been shown to tour players. It will be a great experience for those who are truly interested in mastering the art of green reading. Students will have the opportunity to learn some ground breaking techniques currently been used by some of the world leading players including Adam Scott, Lydia Ko, Stacy Lewis and Sergio Garcia. Just a reminder for those that are booked in to attend the AimPoint Express Level 1-2 or Advanced Level 3 Green Reading Class this upcoming Friday or Saturday. Please arrive 15-20 minutes before class to register your name, payment can be made in cash on the day. We will meet at the main putting green near the terrace @ NSRCC Changi and you only need to bring along your putter and an open mind. I look forward to taking some of you through the classes this coming Friday and Saturday.